They have just been relegated two leagues down. Despair? To the contrary, there was celebration in Munich as TSV 1860 finally returned to downtown Munich from the hated Allianz Arena. On Friday a special, emotional event took place in the Giesing district of Munich. TSV 1860 played the very first official home game at Grünwalder Straße in 12 years. Their old ground had waited patiently since May 2005, when the Lions left for Allianz Arena, a relocation many fans never managed to accept. Circumstances are far from perfect. The club was only able to return after having been knocked down to the fourth league. 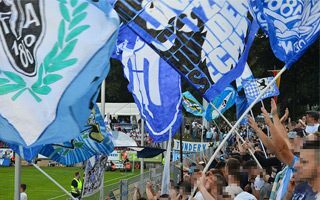 But even so, the atmosphere was celebratory rather than sad when TSV took on Wacker on Friday, during their first Regionalliga Bayern home game. With a capacity of 12,500, the stadium enjoyed some... 12,500 attendance! Interestingly, the club's main supporters group appealed to all fans for respect of their spiritual home. This doesn't only consider the stadium, Münchner Löwen asked for everyone to refrain from leaving any litter in surrounding streets or placing any stickers on private properties. This wasn't always the case at Allianz Arena, but then again Grünwalder Stadion has far thicker residential fabric than the remote giant in northern Munich. “Us Lions, we respect the inhabitants of our neighbourhood. Everyone should behave as if this was their city, village, their street. Out of decency and in the prospect of potential expansion of the Sechger stadium. Be wary yourself, look at other fans and if necessary, influence them to act positively”. The mention of possible expansion is particularly important. With capacity of 12,500 the stadium can hold just over half of TSV's shareholders, currently beyond 20,000. Also, it only meets criteria for up to 3. Liga and with promotion being the goal, the Lions have to hope for expansion and upgrades. In such case, the support or opposition of local residents could prove crucial. This is why both the club and supporters group appeal for fans to leave their cars at home and make use of the public transport ticket integrated with their match card. Following Friday's game the shareholders of TSV 1860 met yesterday to discuss urgent issues. Perhaps the biggest one is Hasan Ismaik. The Jordanian investor failed to meet his obligations and it was thus proposed to terminate all dealings with him within 6 months. The notion was passed with overwhelming majority. As you may recall, Ismaik had promised on numerous occasions to build a private stadium for TSV in a new area of the city. First for 35,000, he mentioned even up to 52,000 capacity. Eventually he didn't only follow through with those plans, Ismaik refused to support the club after their recent relegation, which meant that instead of third league they were pushed down to Regionalliga.